Chapter 5. Harness and Saddlery. ii. The stitching should be carefully examined to see that no portion is giving way, and care should be taken to see that, on that portion of the harness which comes in contact with the animal’s body, it is flat, smooth and free from knots ; prominent, coarse or knotted stitching may cause bad chafes and galls. iii. All metal portions should be sound and in thoroughly good working order. iv. Traces should be most carefully examined to see that they are of equal length and in thoroughly serviceable condition. 2. Generally speaking, the places where harness is likely to wear out are the stitching. the places where various straps, traces, etc., are buckled, trace hooks, hame hooks and eyes. 3. The age of harness and the amount of work that it has done can be fairly well estimated by noticing the amount of wear that has occurred in the metal work at the wearing parts. 1. Care should be exercised in the handling of all articles of harness and saddlery. Saddles should not be dropped or thrown about, as fractured arches or broken side bars may result, and the usefulness of collar pads is liable to be destroyed if they are subject to unfair usage. Minor details should be attended to at once. Stitching should be tested from time to time, as the life of a thread is short compared with that of the leather. Stirrup leathers should be exchanged occasionally, or shortened at the buckle end, so as to bring the wear on fresh holes. Girth straps require special attention and must be renewed as the holes wear. All exposed iron work should be kept bright, except that issued black japanned. It may be cleaned with emery, bath-brick or sand, and rubbed over with on oily cloth. Breakages or damages sustained by harness and saddlery should not be allowed to accumulate ; they must be made good as they occur. The length of traces should be tested occasionally when dry, and such as are found to be too long should be spliced in afresh. Any unevenness on the body side of the neck or breast collars, numnahs, pannels and straps that would be likely to cause galls must be removed. 1. Saddle seats, flaps and rifle buckets, which are required to be kept stiff, should be very slightly dubbed annually, but they should be sponged occasionally with soap. The leather having first been moistened with a sponge, the dubbin (warmed if the weather is cold) should be lightly rubbed in with the sponge or brush ; after two or three days it should be rubbed off, and the leather should then be well polished with a brush or cloth. 2. Leather must not be washed with soda or soaked in water. Its vitality is entirely destroyed by hot water. Washing with soap and lukewarm water, quickly and without soaking, will do least harm if the precaution is taken to apply dubbin or good soap while the leather is slightly damp. Soft soap should be very sparingly used, as it contains an excess of alkali and turns leather dark. It is rarely necessary to scrub leather work. Parts affected by sweat from the horse, such as inside surfaces of breast collars, girths, etc., should be sponged after use with clean cold water and then soaped. Drying leather by the fire destroys its durable properties and is forbidden. Leather parts of harness and saddlery can be rendered more durable, and a bright colour retained much longer, by avoiding washing in water as much as possible. Leather work must, therefore, not be allowed to soak in water whilst it is being scrubbed. 3. Dry cleaning by brush and rubber will be found sufficient to remove dust and dirt in many instances. 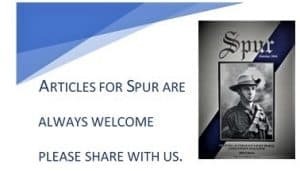 After such cleaning, a little soap or polish for articles in daily use, or dubbin for those to be stored, may be applied. Beeswax and saddle soap, commonly used in the service to give polish to the grain of the leather, are not objectionable, provided that good soap is used to keep the leather mellow. The leather work of all saddlery should be kept soft and supple. Seats and flaps of saddles and handled parts of reins should not be polished. It is particularly important to keep leather girth supple with grease. 4. All saddlery and harness should be taken to pieces periodically, and carefully inspected. Once or twice a year certain parts, such as the inside of breechings and breast collars, should be dubbed, the leather having first been moistened with a sponge. After two or three days the residue of the dubbin should be removed with a dry brush or rubber. All leather work should be dubbed before being put away in store, and should be overhauled from time to time, especially in hot or damp climates. 5. Ropes, web girths and whips should be scrubbed with clean cold water, when necessary, and pipeclay should not be used on them. Saddle blankets, pannels and numnahs should be placed in the sun or wind to dry, and then beaten and brushed. Steel or iron work should be wiped over immediately after use and then rubbed with an oily rag. 6. Black saddlery leather requires greater care than brown. The best blacking only should be used to give it a good appearance. Repairs can be rapidly effected so long as careful attention is paid by all ranks to the condition of the saddlery and harness. Neglected gear will always be a source of trouble. It is important that the mounted soldier should understand the necessity for bringing to notice at once all repairs that may be necessary to the saddlery and harness on his charge, no matter how trivial they may seem. All ranks should also be carefully impressed with the fact that pieces of old harness, etc., are extremely useful for repair purposes, and they should be directed to salvage all derelict and broken harness. Note. – All officers, N.C.Os and drivers must possess a thorough knowledge of the principles of fitting the type of harness used in their units. 52. The saddle – Description and fitting. 1. General description. – The front and rear arches are made of steel ; the front arch forms the pommel and the rear arch the cantle. Both arches are secured to the side bars. The front arch is of channel form. The rear arch is a cantle with a curved spoon – a slop to take a strap exists in each pattern. The side bars are that portion of the saddle which rests on the horses’ back, and to which the front and rear arches are secured, thus distributing the weight of the rider along the animal’s back. The side bars are made of wood and are given a twist in the making, which suits the animal’s back, the shape being such that in the front and rear there is a slight curve both upwards and outwards from the back. 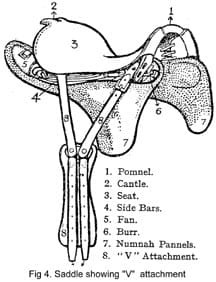 That part of the side bar which projects in front of the saddle is the “burr” ; the projecting portion behind the saddle is the “fan”. Fastened to the side bar just behind the front arch is a steel bar with a roller through which the stirrup leather passes. The numnah pannels. – Side bars are fitted with detachable numnah pannels, the fans of the side bars fitting into the leather pockets at the rear of the numnah pannels, and the “burrs” into the front leather pockets, which are distinguishable by the securing strap and buckle. On each leather pocket which fits on the fan is sewn a brass link for taking the strap of the rifle bucket, etc. The object of the numnah pannels is to give extra padding without filling up the channel of the saddle, to protect the side bars and to give a surface which grips the blanket and avoids slipping of the saddle. “V” girth attachment. – The “V” attachment consists of two straps (the front and rear straps), which connect the sweat flap to the side bar of the saddle, meeting in a “V” shape on the sweat flap, to which they are secured by rivets to a small brass plate. By means of these straps the position of the two girth straps (which are sewn on to the sweat flaps) in relation to the rest of the saddle can be adjusted to suit the conformation of different animals. The front strap of the “V” attachment is in two parts. The upper part, secured to the side bar, has a buckle and the lower part, secured to the sweat flap, is punched with three holes for adjustment to suit the conformation of different animals. It cannot be too clearly emphasized that these three holes are provide solely for the purpose mentioned and should not be buckled or unbuckled daily in girthing or utilized for shortening or lengthening the girth.. The rear strap, the upper part of which is screwed to the side bar and the lower part riveted to the sweat flap, does not admit of, or require, adjustment. The sweat flap consists of an oblong piece of leather to which the straps of the “V” attachment are secured and on which are sewn the girth straps. This is provided for the purpose of preventing the girth straps becoming saturated with sweat and consequently perishing, and also to protect the animal’s side from the girth buckles. The seat is the portion of the saddle on which the rider sits. The seat, which is made of leather, covers the frame of the saddle between the front and rear arches, which are connected by a sling of webbing ; this takes off very largely the strain on the leather. The flap is the covering to the sides of the saddle, made of leather, and of such a shape as to suit the bend of the rider’s legs when his feet are in the stirrups. The stirrup leather is the support for the stirrup iron. It has a buckle at one end and is punched with holes at the other end for adjustment. The stirrup iron is made of steel. The top part is of a semi-oval shape with a slot at the top, through which the stirrup leather passes. The tread is the flat portion on which the rider’s foot rests. The surcingle consists of a plain leather strap, two inches in width, tapering to one inch wide towards the buckle. At the other end is sewn a strap one inch wide, punched with holes for buckling. Girth. – The girth of the riding saddle varies in length from two foot six inches to three feet. It is made of leather or cord, with split openings. There are two buckles at each end to hold the girth straps. At three inches from each end is sewn a leather loop, through which the surcingle is passed before being fastened. i. The withers must not be pinched or pressed upon. ii. There must be no pressure on the horse’s spine. iii. The shoulder-blades must have free and unimpeded movement. the medium of the muscles covering them. of the shoulders to the last rib. The burrs and fans should bear no weight. vi. The saddle should be level on the horse’s back, neither dipped in front nor in rear. The saddletree-maker should be present on all saddle-fitting parades, as a little expert beveling of the side bars can often materially improve the fit of a saddle. 3. There are three sizes of saddle and, to enable a proper choice to be made, the bare saddle-tree should be placed on the horse’s back so that the front arch is above the hollow behind the shoulder. 4. The arches and seat should then be clear of the spine, although this is not always possible with horses possessing high withers. The front arch must be wide enough to admit the hand on either side of the withers. The side bars must bear fairly evenly on the back and their edges must not press into the withers or ribs. 5. The saddle is then taken off, fitted with numnah pannels and replaced. The saddletree will now be considerably raised and the proper thickness of the blanket can be estimated. It must be remembered that the addition of a blanket reduces the width of the front arch and narrows the saddle across the top of the side bars. 6. The blanket is then folded ( Sec. 53.1) and placed on the horse’s back, the tree being placed on it (Sec. 53.2). The blanket must be well pressed up into the front arch, and, before the girths are tightened, it should be noticed whether the burrs are off the shoulders and the fans off the loins ; if they are not, the thickness of the blanket beneath the side bars must be increased by turning it up on either side. The girths are now pulled up and a man placed in the saddle. 7. 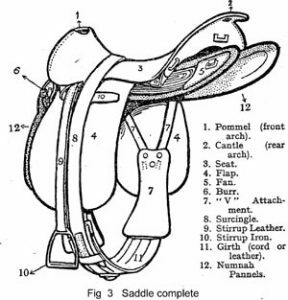 The fit of a saddle cannot be determined until the saddle is inspected with a man sitting on it, for parts which appear well clear of the back when no weight is in the saddle may be brought dangerously close to it by the pressure of a man’s weight. 8. First ascertain that the withers are free from pressure. Make the rider carry his weight forward ; then pass the whole hand beneath the blanket and over the top, and along both sides, of the withers. If there is any difficulty in inserting the hand, the saddle does not fit. 9. Next see that the shoulder-blades are free from pressure. This is done by passing the hand beneath the blanket to the play of the shoulder. If there is pressure, the hand can only be introduced with difficulty. Assuming that the hand can find its way in, the horse’s fore leg should be advanced to its full extent by an assistant. This should be possible without the examiner’s fingers being pinched between the shoulder-blade and the side bar, even if the man is leaning forward in the saddle. If the fingers are pinched, the shoulder-blade will also be pinched, and the saddle must be raised by fitting thicker numnah pannels on the side bar or by making an extra fold in the blanket. Both sides must be tested. 10. The fans should then be tested for loin pressure. With the man leaning back in the saddle, the flat of the hand should find ready admission under the fans. The saddle, having been ridden in for about half an hour, is carefully ungirthed and lifted from the blanket without disturbing it. The blanket will be found to bear the imprint of the side bars and an examination will show at a glance whether they are pressing evenly from top to bottom and from front to rear. The examination must be made without delay, as the elasticity of the blanket soon causes it to lose the impression of the side bars. The commonest places to find excessive pressure are the top edge of the side bar behind the front arch and the bottom edge in front of the rear arch. If there is a deeper impression on the blanket in these places than elsewhere, the pressure is not evenly distributed and the corresponding part of the horse’s back is receiving an undue amount of the weight. With a horse in condition, or with a good blanket or numnah, this may not necessarily cause a sore back ; but it will certainly do so should the animal lose condition or the blanket or pannel be thin, for these conditions will bring the tree nearer to the bony framework of the horse. Irregularity in the fit of the side bars, which cannot be removed by the saddler, may be remedied by the introduction of pieces of numnah to fill up the space between the side bars and the blanket. When the pieces of numnah have been cut to the required shape, they must be fixed in position. In peace this can be done with glue, but in the field they may have to be tied on, or what is better, bound in position by means of a piece of leather (basil) which envelopes the side bar at the required part and can be laced with string across the top. By means of these strips of numnah the most radical alterations in the fit of a side bar be effected in a few minutes by man who has but little technical skill. 1. The folded blanket should be placed on the centre of the horse’s back, care being taken that no grass or grit adheres to it. It should be folded to such a size that it projects about two inches in front of the burrs and behind the fans. It can be folded several ways. With a horse of normal shape and condition the following method , entitled the “double fold “, is recommended :- Double the blanket lengthwise, then double it again crosswise. It should then be placed lengthwise across the horse’s back with the selvedge edges on the near side and to the rear. The size when folded is 2 feet 8 1/2 inches by 2 feet 4 inches. The folding of the blanket may be modified to suit special horses and to meet alteration in the shape consequent on falling away in condition, or from other causes. In the case of a horse which has fallen away in condition, and for certain shapes of back, a useful method is the “channel fold”. The blanket is folded lengthwise in three equal parts, each end is then turned over and folded towards the centre (two or three folds may be taken as required to suit the horses back, leaving a channel in the centre). 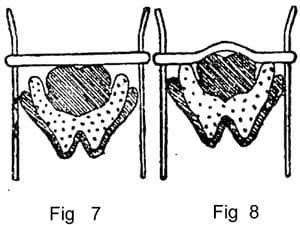 In cases where an extra thickness under the front arch is required the “envelope fold” may be found a useful method. The blanket is folded in three folds of equal width in the length of the blanket. A fold of two feet is then made at one end ; the other end is turned over, forming a pocket, into which the opposite end is tucked ; it is then placed on the horse’s back with the thick end near the withers. When this method is used, a second blanket is necessary to prevent rubbing of the “v” attachment. 2. The front of the saddle should not be so far forward that it interferes with the play of the shoulder. The pannels of the saddle should lie flat on top of the horse’s ribs, the weight of the rider being borne by the part between the front and rear arches. The burrs and fans should bear no weight. The front arch, when stuffed pannels are attached, should clear the withers to the breadth of not less than two fingers when the rider is in the saddle. The saddle, to afford a suitable seat for the rider, should be level, neither dipped in front nor in rear. 3. The girth should be placed about four inches behind the point of the elbow. It should be sufficiently tight to keep the saddle in its place and no tighter. It should be tightened gradually, and not with violence, care being taken that the skin is not wrinkled. It is recommended that the girths of all except young and growing horses should be fitted with the buckle in the second or third hole from the free end of the strap. 4. The surcingle should lie flat over the girth and be no tighter than it. 5. The stirrups should be attached to the saddle as follows. Pass the end of the stirrup leather through the stirrup iron, then through bar on the side bar of the saddle from below, inwards to outwards, then fasten to the tongue of the buckle. The buckle should be then pulled up close to the bar on the side bar, the point of the stirrup leather passed under the two leathers from the front, then passed under the surcingle. For the fitting of stirrups, see Sec. 61.4. 6. Adjustment of the “V” attachment. – The normal position of the attachment is with the buckle in the centre hole of the three – 6 1/2 inches from the rivet ; this position will suit a very large number of horses. The upper and lower holes are provided for adjustment ; additional holes must not be punched. On animals with straight shoulders that carry the saddle too far forward the front strap should be shortened by buckling it in the lower hole ; on those that have deep chests on sloping shoulders and are thick in front of the saddle the front strap should be lengthened. In no case will it be worn as a true “V”, i.e., the front and rear straps of equal length ; this would depress the hinder part of the saddle and cause other difficulties. Care should be taken in all cases to buckle the near and off straps in corresponding holes. 7. The wallets should be placed pommel of the saddle with the hollowed side of the connecting piece to the front. The wallet strap should be passed from the rear through the rearmost staple on the saddle, then through the keeper of the wallet, next through the front staple of the saddle and finally buckled, the point of the strap pointing to the rear, the buckles being in line with the front edge of the wallet. 8. The near shoe case, holding the frog, is attached to the rear arch of the saddle on the near side, the girth being passed through the steadying strap, which should be of such a length as to allow the sword to hang vertically. 54. 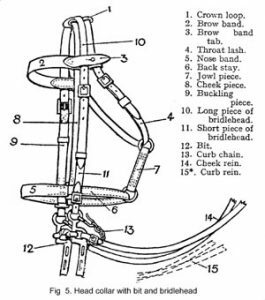 The head collar – Description and fitting. 1. General description. – The service head collar (see Fig. 5. ) is constructed in such a way that it can be used either as a bridle or as a head collar in the stables and on the picket line. The crown loop is a small piece of leather, consisting of two loops which connect the cheek piece and throat lash at the top of the bridle on the animal’s poll. The brow band consists of a leather strap with two loops at each end, through which both the cheek piece and throat lash pass, and over these loops lie the tabs, which are small leather straps stitched on the brow band and fastened by a brass stud which is sewn into the loop of the brow band, through which the bridlehead passes. The object of the brow band is to prevent the cheek piece and the throat lash from slipping backwards. The object of the tab is to hold the bridlehead in position. The cheek piece consists of a strap of leather sewn on at one end of the square which connects the nose band and back stay together on the near side. At the other end it is punched with holes for securing to the buckle of the buckling piece. The buckling piece to the cheek piece consists of a strap sewn on at one end to the square which connects the nose band and back stay together, but on the opposite square to that which holds the cheek piece. At the buckling piece is a buckle to which the cheek piece is fastened. The cheek piece and buckling piece, when fastened together, support the nose band and back stay in position. The throat lash consists of a plain leather strap with a buckle at one end and punched with holes at the other for adjustment. The throat lash secures the bridle on the animal’s head. The nose band and back stay are two leather straps connected to each other by two square links. On the back stay runs the lower ring of the jowl piece. The jowl piece consists of a short piece of double leather with a ring sewn on to each end, connecting both the throat lash and back stay. The long piece has a buckle and leather billet at one end for securing to the bit, and punched with holes at the other end for adjusting with the short piece. The short piece has a buckle and leather billet at one end for securing to the bit, and at the other end is a buckle for engaging with the long piece. The bit, reversible (Fig. 6), which is made of steel, is of two patterns, namely, one with a smooth mouth piece and the other with the mouthpiece “twisted” on one side, but very few of the latter are provided. The eye is the loop at the top of the cheek through which the billet of the bridlehead is passed. The upper, centre and lower bars are the ring and slots through which the leather billet of the rein is passed. The mouthpiece with port mouth and canons is the steel bar which joins the cheeks of the bit. The straight parts are called canons ; the bend in the centre is called the port mouth, the object of which is to give the rider greater leaverage on the animal’s mouth if required. The curb chain is the steel chain of 19 links secured the eye of the bit on oneside and to the curb hook on the other eye. The bits are issued in three sizes – large, medium and small. Brow band. – The brow band should be just long enough to allow the cheek piece to pass from the crown down, without rubbing the bones on each side of the temple or cutting the base of the horse’s ears. Cheek piece and buckling piece. – The cheek piece and buckling piece should be parallel to and behind the projecting cheek bone. Throat lash. – The throat lash should fit loosely, being only sufficiently tight to prevent the head collar from slipping over the horse’s ears, thus in no way interfering with the breathing or swallowing. A good guide is to allow the breadth of the hand between the throat lash and the horse’s cheek. The buckle of the strap should be in line with the horse’s eye on the near side. Nose band and back stay. – The nose band and back stay should fit so as to admit the breadth of two fingers between the horse’s nose in front and the nose band, and between the horse’s jaw and the back stay. The nose band and back stay should hang so as to allow two finger breadths below the projecting cheek bone. 3. Bridling. – The bridoon (used for training remounts) should touch the corners of the mouth, but should hang low enough not to wrinkle them. 4. The bit should be put in the horse’s mouth with the smooth side of the bar against the tongue. It should be so placed that it is not high enough to wrinkle the lips, or low enough to touch the tush (rudimentary in the mare). The mouthpiece will be correctly placed between these limits when, the lower cheeks being drawn back to approximately 45 degrees to the mouth, the curb chain lies flat and truly in the chin groove. The proper length of the curb chain, and the right position of the mouthpiece, depends on each other, and on the sensitiveness of the horse’s mouth. Generally speaking the softer the mouth, the higher should be the mouthpiece, and the harder the mouth, the lower. But the mouthpiece will always be too high when a curb chain of suitable length rises above the chin groove. 5. The curb chain should be fixed permanently on the off side of the bit. The adjustment to the near hook should be made by twisting the chain to the right until it is quite flat, putting the last link on the hook and then taking up as many more links as may be necessary. Generally speaking the “greener” the mouth, the longer should be the curb chain. 6. Care should be taken to fit each horse with a bit of the correct size. A narrow bit pinches the horse’s lips ; a wide bit moves from side to side and bruises them and also causes uneven pressure on the bars. Figs 7. and 8. represent bits without and with a port and show a section of the horse’s tongue and lower jaw. When a bit with a straight bar is used, most of the pressure is taken by the tongue. The use of a bit with a port brings pressure to bear on the bars, because the tongue tends to fit into the port. The tongue, by moving, is able in effect to alter the position of the spot on which the pressure is exerted in the case of a straight bit ; but when a port-mouthed bit is used, the latter always bears on the same portion of the bars. A bit with a straight bar, therefore, has an effect on the horse very different from that caused by a bit with a port. i. Previous training of the horse. ii. Temperament of the horse. The greatest care should, therefore, be taken to fit a horse with the mouthpiece which suits him best and, when a bit is first used, care must be taken that its pressure on the tongue is not such as to induce the horse to get his tongue over the bit. 7. A bit with a very high port is severe because the port presses on the roof of the mouth when brought into play. The effect is increased, and may be made cruel, by a tight noseband which prevents the horse from opening his mouth. A very narrow port is also severe because it pinches the tongue. The use of very narrow or a very high port should never be allowed except in special circumstances and for particularly good horsemen. 8. When a bit with a sliding bar is used, care must be taken that the horse’s lips are not pinched between the cheek and the bar owing to the holes in the latter having become too large from wear. 9. The reins should be of such length that, when held by the middle in the full of the left hand, with a light feeling of the horse’s mouth, they will touch the rider’s waist. 10. The head rope should be fitted by passing the end through the bottom ring of the jowl piece from the off side, then through the ring of the head rope and over the horse’s neck from the near side. 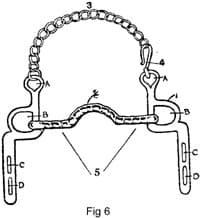 The head rope is then secured by four complete coils and two half coils, and adjusted so that the front of the coil is a span of the hand from the bottom ring of the jowl piece. 1. The breastplate is not as a rule required. It is only necessary on horses whose conformation is such that the saddle is constantly slipping back. When used it should be so fitted that the upper edge of the rosette or leather is three finger-breadths above the sharp breast bone. It should admit the breadth of a hand between it and the flat of the shoulder. 2. The standing martingale should be used only for exceptional horses. It should never be necessary for a horse which is well trained and is of reasonably good conformation. i. For a horse which naturally carries his head so high and whose head and neck are so badly put on that it is no effort to him to evade the bit by raising his head. ii. For a horse which has been badly trained and has learnt to evade the bit by throwing his head up. A standing martingale gives the rider a certain amount of control by preventing this evasion. iii. For a horse which, because he is afraid to face his bit, or as a result of bad riding and being jobbed in the mouth, has developed the habit of jumping with a hollow back. A standing martingale, by preventing his getting his head up, may cure this by inducing him to round his back and jump in a better style again. The standing martingale should be fitted of such a length that there is no strain on it until the horse has got his head above the proper position. Its action is automatic and independent of the rider’s hands. It does not interfere with the recovery of a horse which makes a mistake at a fence, except when he drops his hind legs into a ditch or water. i. To help in keeping a horse straight, as, for instance, when riding him at a fence. For this purpose the rings of the martingale must be closely connected together,that is, not more than four to five inches apart ; a pull on one rein is then communicated to the other through the martingale rings and their connection. Its action for this purpose is the same as that of an “Irish” martingale. ii. To ensure the pull of the reins on the horse’s mouth being in the right direction if the rider gets his hands into the wrong position. For this purpose it may be mounted either on a snaffle or a double bridle. If used with a double bridle, it should be put on the curb rein ; this will ensure the pull on the bit coming from the right direction and will not interfere with the action of the snaffle in placing the horse’s head.It should not be used for keeping a horse’s head down, which is the legitimate use of the standing martingale. If used for this purpose, it interferes with the correct action of the rider’s hands on the horse’s mouth.Owing to the fact that, when properly fitted, it ensures the pull on the bit coming from the right direction, however high the rider’s hands are, it tends to make him careless about their position and should therefore not be allowed with recruits on trained horses in the riding school. It should be fitted so that it has no bearing on the reins as long as the rider’s hands and the horse’s head are in the proper position. 4. The neck-strap of a breast plate or martingale provides a useful support for the rider, who can lay hold of it in an emergency and so avoid using the reins to keep or regain his balance.